Cuenca Grade 2 - Is similar to a Sub Fino Montecristi hat grade. 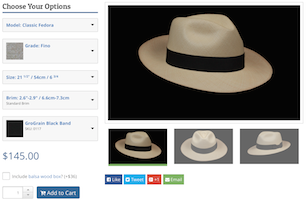 The Classic Plantation Panama hat is known for a larger brim and great sun protection. Uses the same block as Fedora #1, but the difference is in the brim, and blocked in standard oval. The front of the crown is 4.1" - 4.3", and the back of the crown is lower then the front measuring between 3.3" - 3.5" giving it a sloping appearance from the side profile. The height on the side is 4.1" - 4.5". This Classic Plantation Panama hat is blocked on a semi oval hat block rather then a perfectly round one to fit better. Send us your question about this Cuenca Grade 2 Plantation hat, and we will respond to you as soon as possible.